Affordable high quality large format CCD and CIS scanners with optimized color imaging performance. Large format scanners featuring a wide color gamut and up to 1200dpi optical resolution that are ideal for full-color graphics, photographs and maps. Fast reliable performance every time. wide color gamut and high dynamic range. These large format scanners will also capture accurately the finest details in maps, engineering drawings, blueprints, site plans, architectural renderings and many other technical documents in monochrome or color at resolutions from 100dpi up to 9600dpi. Original images can be captured from media starting with 6”, up to 48”, wide by any length, and the GxT models provide motorized thick media scanning of mounted originals up to 0.8” (2cm) thickness. B2. With a small footprint, it is ideal for Small Office, Home Office, On-site Building Services, Architectural, Engineering, Construction and more. The NEW generation of SmartLF SC 36 Xpress large format scanner is ideal for Technical and CAD Drawing Offices, Architectural, Engineering, Construction, Facilities Management and Electronic Document Capture (EDC). 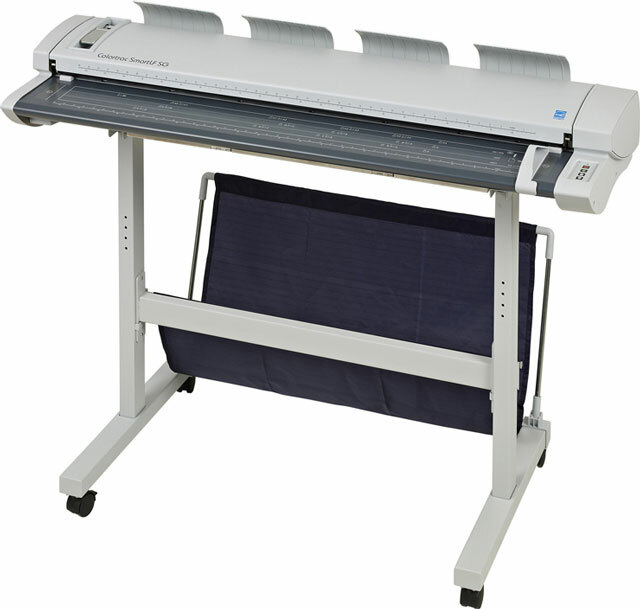 Using the new SuperSpeed USB3 digital interface and SingleSensor digital imaging makes this wide format scanner the best solution for general purpose Technical Imaging and Color Graphics. Shown with optional PC mounting arm. imaging, higher scanning speed and SuperSpeed data transfer, the SmartLF SC 42 provides fast, high quality scans or copies of wide format maps, site plans, engineering drawings, blueprints, architectural renderings and many other technical documents. bi-directional LED light system that has low energy requirements, a longer life and reduced environmental impact with the superior color imaging attributes of CCD technology. reduced environmental impact with the superior color imaging attributes of CCD technology. Can scan documents up to 0.8″ thick! The NEW generation of SmartLF SG series high definition large format scanner models come in each size (36in or 44in) with performance levels and features optimised for different applications. If requirements change, the M (monochrome) and C (colour) models can be easily remotely upgraded to a higher level using a simple emailed scanner upgrade tool. The E (enhanced) upgrade offers the highest colour scan speed. Monochrome scan speeds are identical across all upgrades. The SmartLF GxT+ 56 range offers high 600 dpi optical resolution, superior color CCD technology and the benefits of instant-on bi-directional LED illumination. These scanners meet the needs of AEC, CAD and GIS users for sharply defined line detail in technical documents and maps while producing the highly accurate color reproduction, copying and wide color gamut required for demanding graphics applications. Can scan documents up to 0.8″ thick!